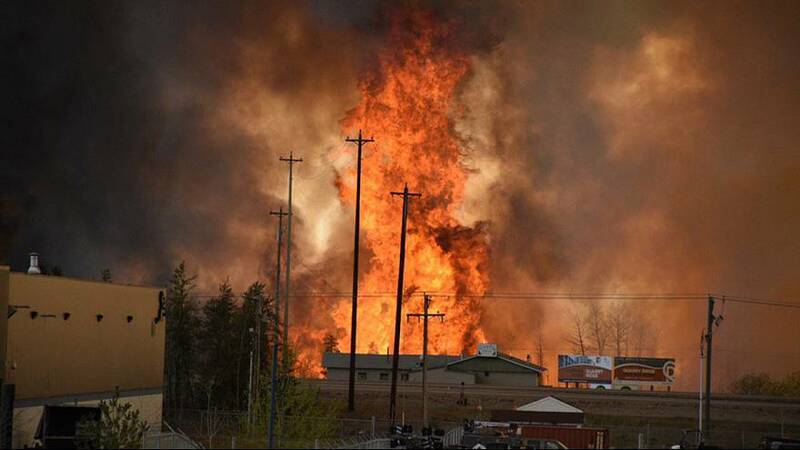 Wildfires are threatening to engulf the remote city of Fort McMurray in western Canada. One neighbourhood of the city has already been destroyed. Local authorities say others have been badly damaged. Hot, dry winds have been forecast and the fear is they could fan the flames further. Nine air tankers, more than a dozen helicopters and around 150 firefighters are on the scene. The province of Alberta has asked for help to bring the blaze under control. The regional government has ordered all 80,000 residents to evacuate the city. An estimated 44,000 had fled by late on Tuesday. 8,000 are at a reception centre outside the town. The authorities are working to set up more emergency accommodation. All patients have been successfully evacuated from Fort McMurray’s hospital. What about deaths or injuries? So far, no casualties have been reported. Local mayor Melissa Blake says a baby has been born at an accommodation centre for energy workers turned into an evacuation centre. Has there been much damage? 80% of Beacon Hill, a southern residential neighbourhood, has been destroyed by the fire. The neighbourhoods of Abasand (4,900 residents) and Waterways (600+) are also considered as lost. The fire broke out southwest of Fort McMurray in the heart of Canada’s oil sands region on Sunday. It shifted rapidly with the winds, reaching the city limits on Tuesday. Its size at the time was estimated at 26.5 square kilometres or 6,540 acres. Experts think Alberta could be in for a long and expensive wildfire season this year. It has been much drier than normal due to a mild winter with lower-than-average snowfall and a warm spring. The Army and Air Force are on their way. However, they could take two days to arrive. “Canada is a country where we look out for our neighbours and we are there for each other in difficult times and certainly in Fort McMurray the difficult times they are going through right now is something we are going to unite around across the country.” – Canadian Prime Minister Justin Trudeau says the country is rallying round. “Fuel is not readily available – do not attempt to travel south without sufficient fuel.” – the regional government tweeted.